Herein lies a seamless blending of hard-boiled crime, absolutely channelling the spirit of Raymond Carver, playing perfectly alongside a distinctly futuristic and disturbing vision of the sinister world of memory mining from implanted chips. As you can see from the synopsis, our erstwhile hero Steven ‘Rocket’ Malone has his work cut out, reuniting an errant head with a body, evading gambling-debt collectors, trying to resist the charms of a femme fatale and -oh- trying not to get killed or swindled by the nefarious individuals also seeking the contents of said missing head, in downtown Washington DC. Yes, as a plot its a little outlandish, a little quirky, and at times very strange indeed, but do you know what? It works. I thought the storyline was great- tightly written, well-structured and totally entertaining, with its pastiche of the gumshoe era, the hardboiled, spare dialogue, and the little clever nuances of the plot which made this a real read in one night book. Also there was a wonderful feeling that perhaps in part to its overall strangeness you really had not a clue how, and if, it would resolve itself at the end. It was twisty and surprising, with a great sense of the author genuinely enjoying the whole creative process of the book, and taking his readers on a bit of a day trip to Oddityville. Great. It’s funny and violent in equal measure with a colourful cast of characters, all pulling at, and trying to manipulate Malone this way and that, as he tries to feather his own nest, and keep his own head intact. He’s a really well-formed character, exuding a mix of roguish charm and street smarts, with a nifty line in caustic humour. I loved the interplay between him and Tony Lee, the resident nerd at Infinity Corp, the malevolent Attila The Hun and his henchman Ladykiller Lou, and his seemingly utter powerlessness in the rarefied air of Selene Belle- the resident femme fatale. Not to mention the unerring antagonism between Malone and the local law enforcement, due to his previously chequered career in the police force. Malone is not a popular chap, but makes for a brilliant protagonist, by turns bruised, abused, but never broken, and bolstered by an entertaining and amusing cast of ne-er-do-wells all the way. Having recently had a gruelling repetition of grief and angst in my last few reads, this was an absolute tonic. 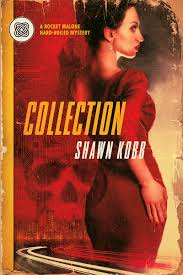 Smart, sassy and entertaining, Shawn Kobb is one to watch. An excellent book, that I very much hope will develop into a series. A return for Rocket please.